Kilbride is promoting a new Strategic Rail freight development of approximately 8m square feet of B8 logistics warehousing and a 775m intermodal rail terminal through its joint venture, Four Ashes Limited (FAL), with Grosvenor Group and local landowner Piers Monckton. Following three consultation processes, Four Ashes Ltd (FAL) submitted an application for a Development Consent Order (DCO), for the West Midlands Interchange (WMI), a proposed new strategic rail freight interchange (SRFI) in South Staffordshire which is to be examined by the Planning Inspectorate (PINS). 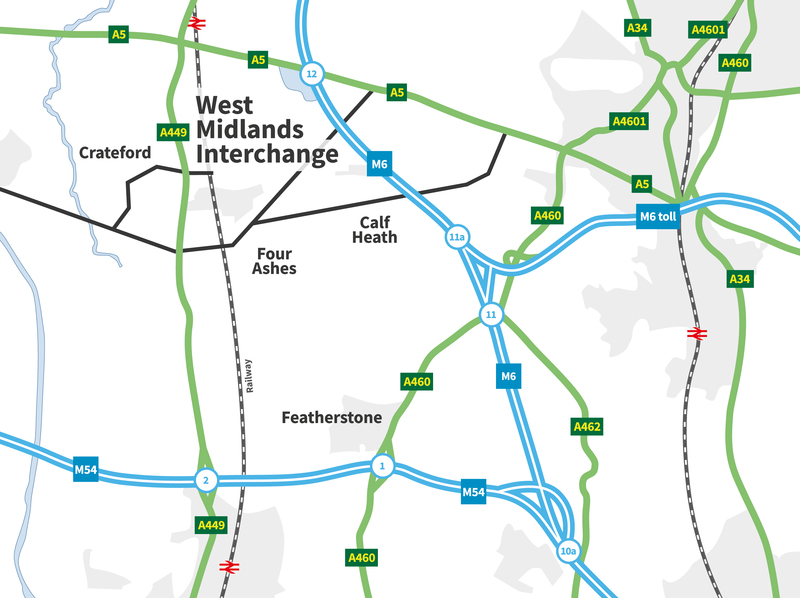 The WMI proposals directly respond to national strategy and the needs of the region comprising the West Midlands, the North Black Country and South Staffordshire. The North Black country/South Staffordshire area has been identified as one of the best locations in the West Midlands for an SRFI since 2004. The proposed scheme has been designed to increase the efficiency of freight distribution, taking freight traffic off motorways and trunk roads and onto the rail network. This will also reduce CO2 emissions emitted by freight transport; rail freight produces up to 70% less CO2 and up to 15 times lower noxious emissions than road freight tonne for tonne. The Four Ashes site has also been identified for its potential to boost economic growth through its location in the M54 Wolverhampton – Staffordshire High Growth Zone. It supports both the Government’s Modern Industrial Strategy and the ‘Midlands Engine’, which together aim to help deliver a high-skilled, competitive economy that benefits people in the West Midlands and throughout the UK. As well as helping to attract more global business and investment, the scheme will create 8,550 direct jobs, boosting opportunities for people in South Staffordshire, the Black Country and other surrounding areas. It is expected to generate £427m of local economic activity each year and, through the supply chain, create £912m per annum of economic activity nationally. As the WMI proposal constitutes a Nationally Significant Infrastructure Project, it is considered under the Planning Act 2008 rather than the normal town and country planning route, meaning FAL has applied for a DCO from the Secretary of State for Transport. The DCO application was submitted to PINS on 03 August 2018. After a 21 day assessment period, PINS has concluded that the application has met its standards and the application will now go forward for examination. The Examination process will now be led by PINS, and further information can be found on its website. PINS will invite stakeholders and the public to register their interest in participating in the examination. PINS will then set a timetable for the examination which is expected to last six months starting with a preliminary meeting, at which those who have registered will be invited to attend. The submission documents and further information on the PINS process can be found on the websites bellow.